1. Preheat the oven to 200ºC, gas mark 6. Place the beetroot wedges in a roasting tin and drizzle with the balsamic vinegar. Spritz with olive oil, season with pepper and roast for 15-20 minutes. 2. Pile the salad onto 2 plates and add the beetroot. 3. Top with the smoked trout, pour over the dressing and serve with the potatoes. 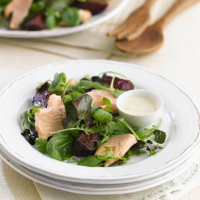 Smoked fish makes for a classic pairing with beetroot. You could also try this recipe with hot smoked mackerel fillets or Kiln-roasted Scottish salmon flakes.